There are a number of business education applications that are now available to help both prospective MBA students and actual MBA students advance to the next level. These applications include software for iPhone and iPad users. With some of them designed in such a way that they assist MBA student prospects with passing GMAT, while others have been created to help enhance MBA instruction for bona fide students of this master’s degree program. Now here is a list of some of the best iPhone and iPad applications for MBA success below, please do let us know if you use any of these listed below. If we have not mentioned a good one we would love for you to share them with us and why it is better than these ones here. The very first step to succeeding with MBA is in gaining admission into business school. But in order to get this right you need expert opinion, tips and advice. Okay this is what this iPhone application provides at $1.99. It tells you how to create a winning MBA application. And, its primary focus is on essay writing as well as essay questions that result from them. Through this app you get to learn essay-writing techniques such as skimming technique, appropriate font size usage, appropriate words or phrases to use, etc. This free application from Apple will allow you access different courses via your iPhone, iPad or even iPod Touch. With it one can watch videos, hear audio lectures plus view presentations as well as read eBooks. Although iTunes app has been designed to help students with delivering their lectures, others can also make use of this application since it helps with accessing educational content. You can learn almost everything you want to learn for free through Khan Academy. Its new iPad application includes almost 100 GMAT videos. In addition to this, there are different videos on various subjects like economics, finance, currency, banking and money, among others that will be useful to both MBA applicants as well as students. With this iPhone application MBA students should be able to have a good understanding of the primary concepts relating to business management. There are 10 articles included with this application. And, they describe management concepts and how these can be implemented in a company. Furthermore; besides helping MBA students with their study this application will be useful for those of them wishing to begin their own company or small business. MBA for Start-ups is a free app. 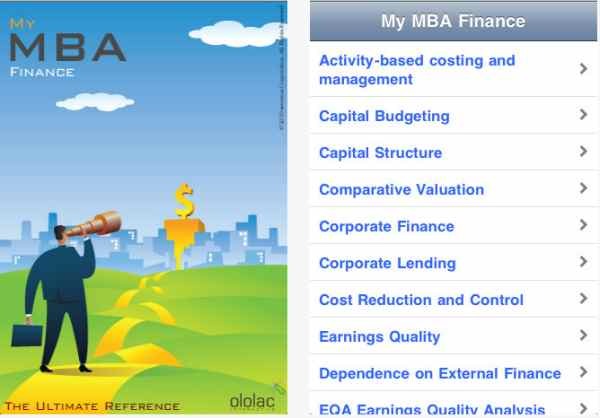 Pocket MBA is at the least a “should have” application for any aspiring MBA graduate. It combines an explanatory full-text book with comprehensive self-tests and interactive flashcards to bring about an educational experience that is completely user-controlled. Upon successful completion of this course, you would have had a good understanding or solid grounding in market influences plus a firm understanding of economic conditions affecting every business. At a cost of approximately $1 this app is truly worth it. MBA students preparing for job interviews will need it. And, even as they wait to attend any interview they can quickly go through likely interview questions that they could be asked. This is great since they will not be allowed to go in here with books in the first place. This app is an educational and business professional reference tool. It is part of a series that is designed to offer professionals and MBA students alike comprehensive knowledge of important finance concepts as well as terminologies. Some of the areas it covers include: capital budgeting, corporate finance, capital structure, corporate lending, liquidity analysis, venture capital, foreign exchange, monetary economics, international finance, micro finance and so much more. Author Bio: Jason Phillips is an education consultant and owns a website about higher education and admission consulting. Apart he is a freelance writer and a guest blogger. Click here to get consultation about MBA. Posting is often our own 1 type of passion along with frequently As i published after i find a quality extra time. Your current producing could be very well-informed along with enjoyable 1 look for anyone in regards to the producing procedure. Through which has the ability to might make anyone more make an impression on in regards to the producing vocation…..